NOW ALL ROOMS HAVE A PRIVATE BATHROOM !!! Experience the new atmosphere of one of the best places in Prague. The charming place Museum Inn offers high standard hospitality services ready to pamper our guests and the staff will make your stay as comfortable and convenient as possible.Thanks to our location expose yourself to Prague's history and glamour right outside the door. Museum Inn Prague is located in the heart of Prague just a few steps from the Wenceslas Square. All major sightseeing points are within the walking distance. 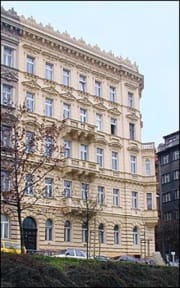 The Museum Inns location allows our guests to walk directly into the Wenceslas Square. Our Museum Inn is situated within walking distance to all public transportation. The Main Railway Station, the underground station 'Muzeum' and 'Mustek' are just around the corner. On the way from Vienna, Dresden, Frankfurt or Prague International Airport main highway can lead you easily to our Museum Inn. Museum Inn is an ideal place to choose while visiting Prague. Our Museum Inn has prepared special rates and packages to enhance your stay during spring and summer.